Running out of fuel on your current build? Want to support more power or a different fuel type? 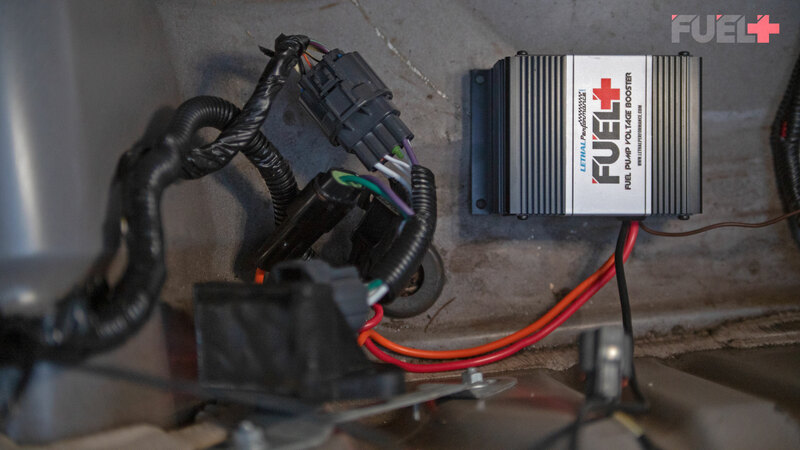 The Lethal Performance FUEL+ plug and play fuel pump booster is the answer. Click here to check out the FUEL+ lineup! 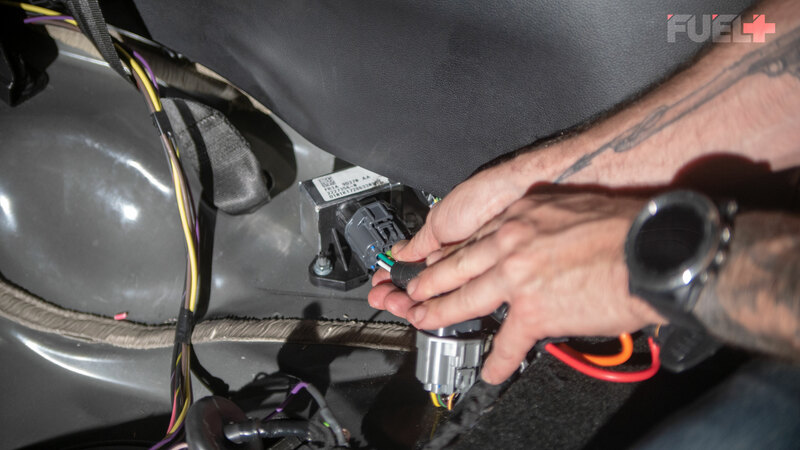 Our 40amp fuel pump voltage booster provides a constant 18v to your factory fuel pump giving you the ability to support more power and different fuel types. 100% plug and play design makes installation of the FUEL+ a breeze. No cutting or soldering is required due to our OEM style wire pigtail. 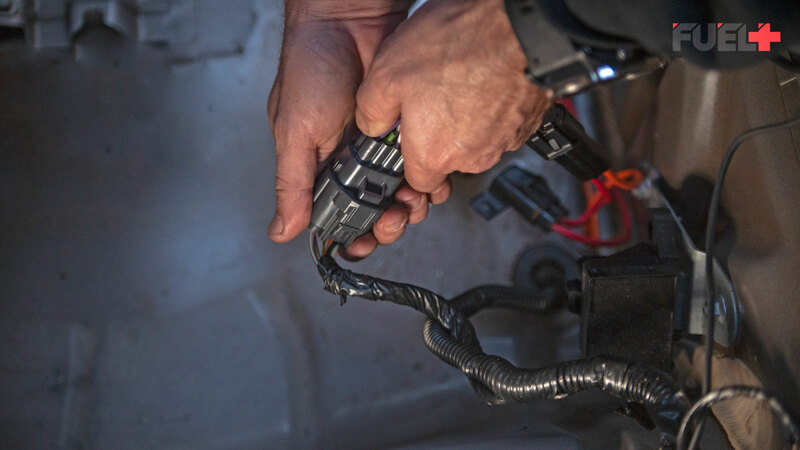 Simply unplug the connector to your factory FPDM (fuel pump driver module) and install our FUEL+ unit along with the OEM style pigtail and you're in business. 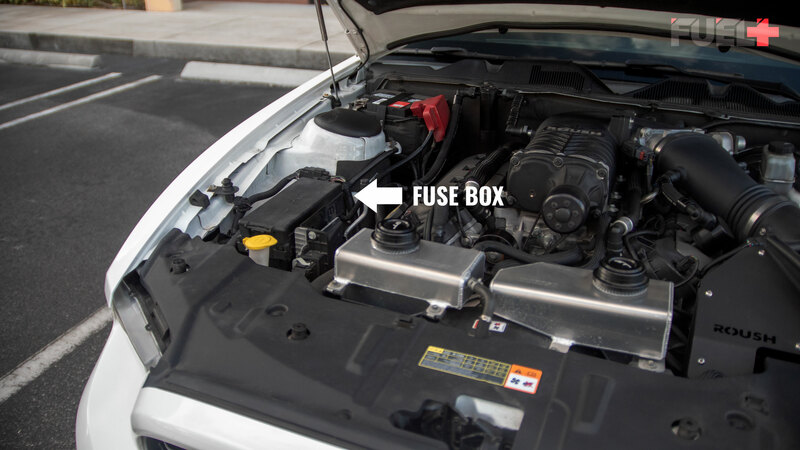 The FUEL+ works for E85 conversions and those running aftermarket supercharger and turbo setups. The FUEL+ is also tuner friendly and very reliable. For 2005-2014 Mustang GT/GT500, it will be located in your trunk at the rear of the spare tire well. See below image. For 2015-2019 Mustang GT you will need to remove the back seat. Once removed, locate the FPDM on the driver's side. See below image. 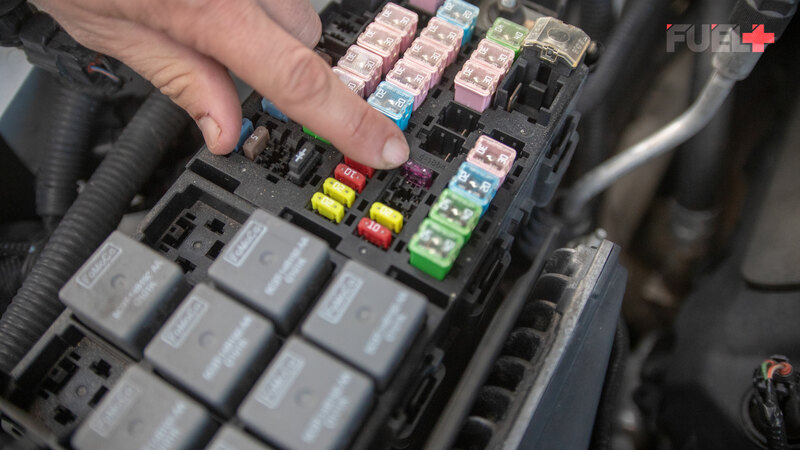 Unplug the factory FPDM and remove from the vehicle using a 10mm socket. 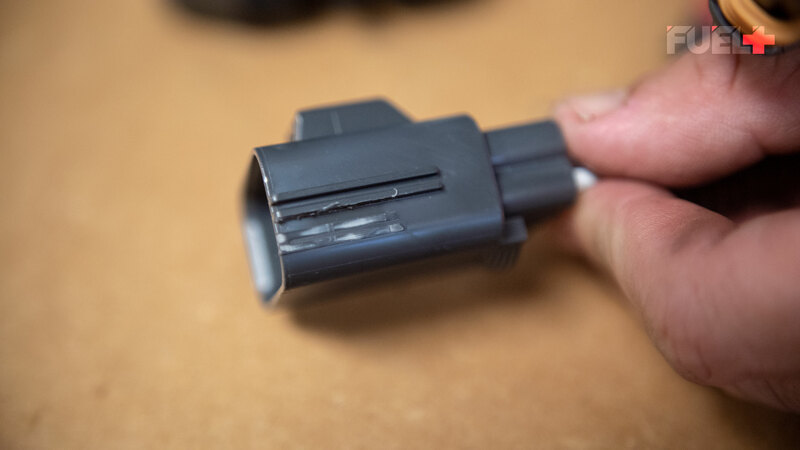 Once removed, you will need to modify the connector housing of both the FPDM and the supplied pigtail. On the FPDM, you will need to remove ribs on the outside so that there are only 2 small on each side. See below images. Remove larger outside fins of FPDM connector. 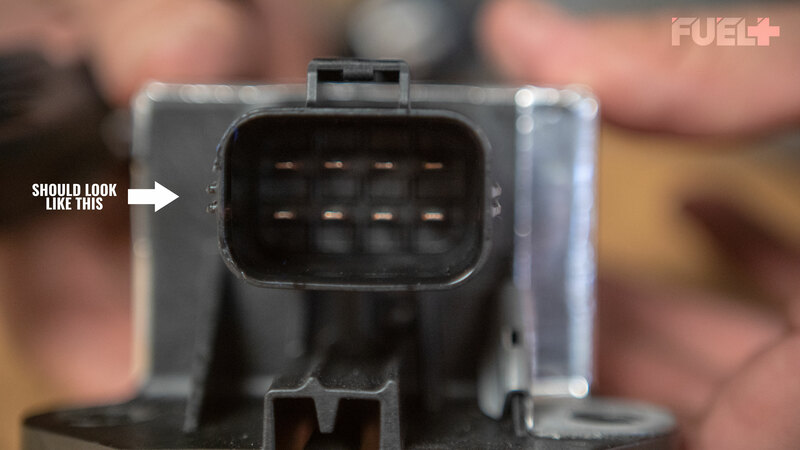 The FPDM connector housing should look like this once modified. On the supplied FUEL+ pigtail, you will want to remove the shorter ribs that end in an angle. See images below. You will need to remove this tab from the connector. Remove the rib using a blade or similar. 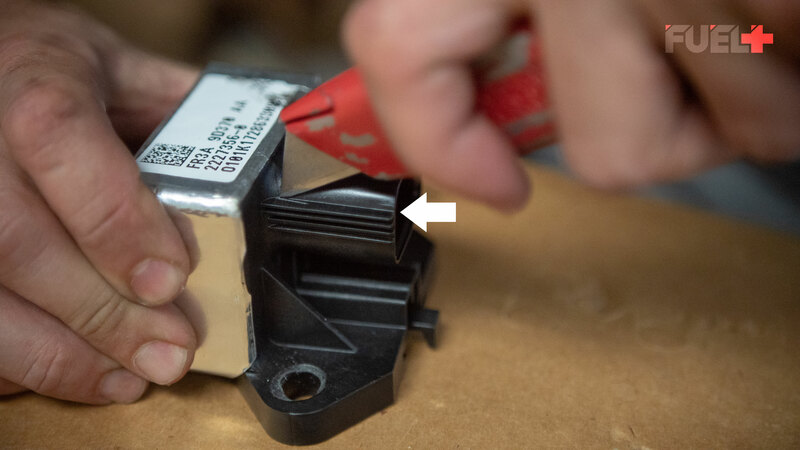 Once removed, the connector should look like this. 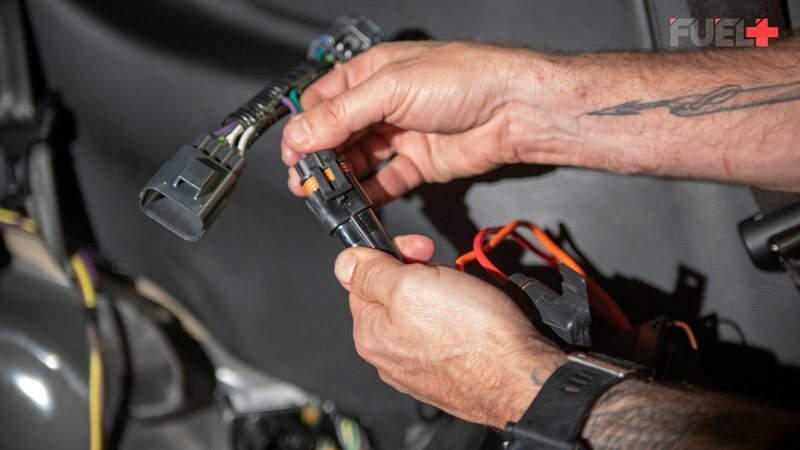 After you have modified the connectors, you can return to the vehicle with the pieces and proceed to the next step. Find a ground for the black ground wire. 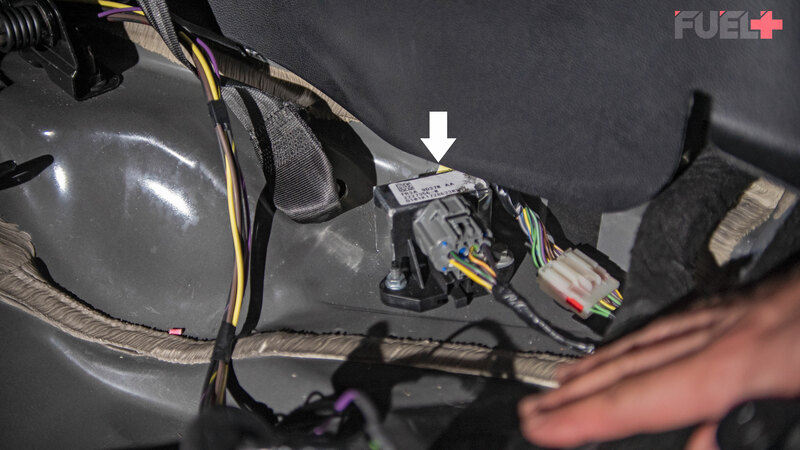 For 2005-2014 Mustang GT/GT500 the best location is the factory ground bolt located behind the trunk plastic trim. See image below. Factory ground located behind the rear trunk trim panel. 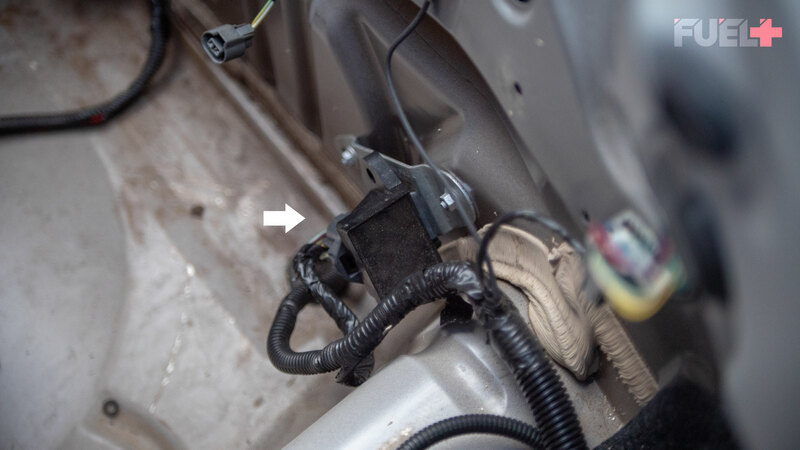 Use the factory 10mm bolt that attaches the FPDM to the chassis to ground the wire. 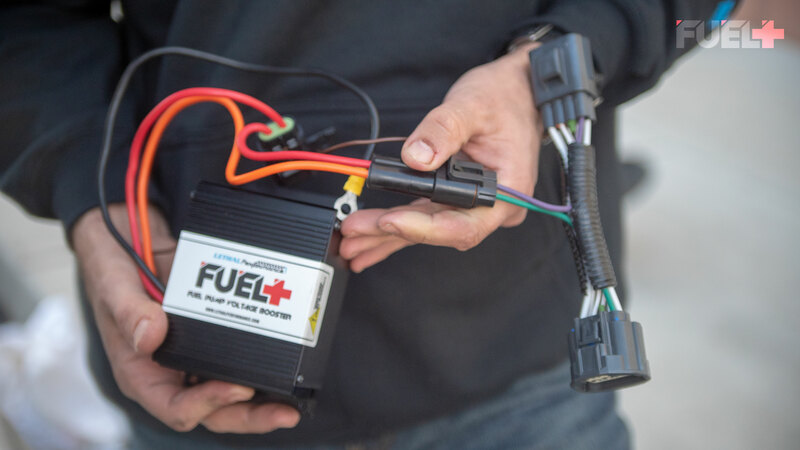 Using the supplied pigtail harness, connect the FUEL+ to the factory FPDM and factory harness. See images below. 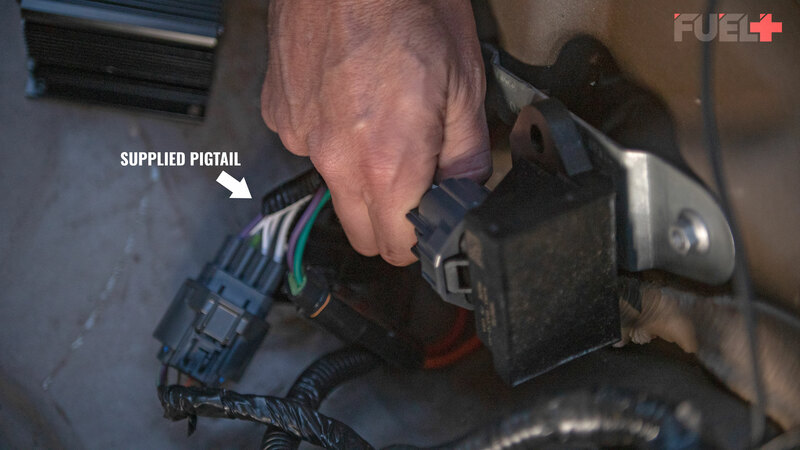 The small side connector of the pigtail will plug into the FUEL+ connector. 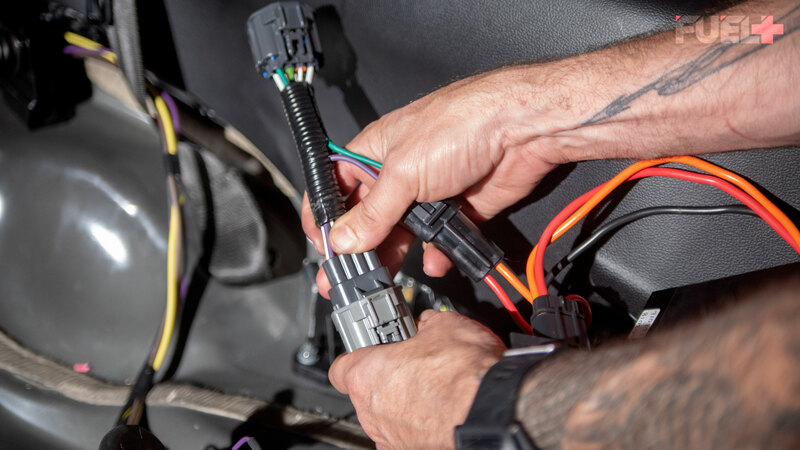 Next, plug the connectors in line to the OEM harness & FPDM connection. Next step is to mount the FUEL+ unit. 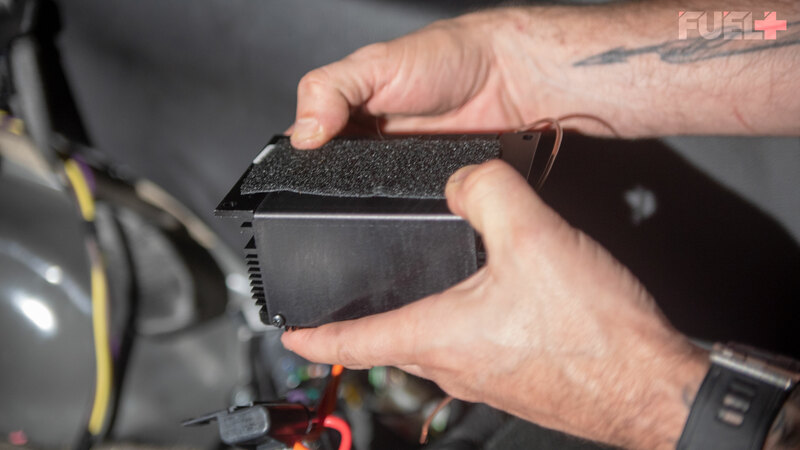 Attach one side of the supplied adhesive velcro to the back of the FUEL+ unit. See image below. 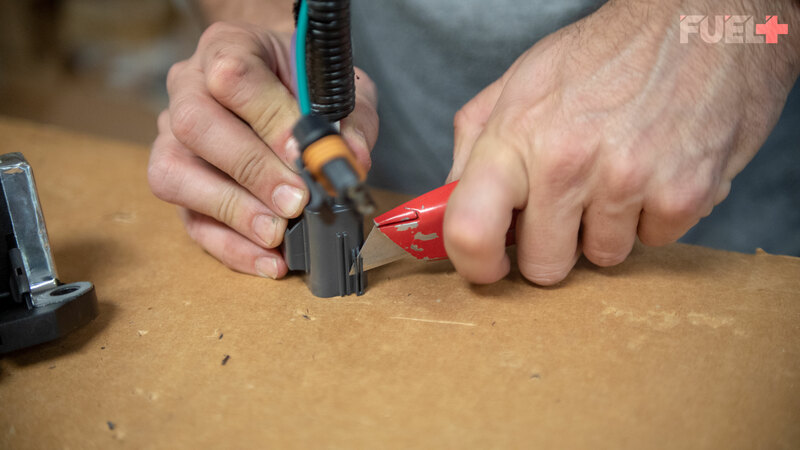 Attach one side of the supplied adhesive velcro to the unit. For 2005-2014 Mustangs, the spare tire well is the optimum mounting position. Make sure there is clearance for the spare tire if your car came with one. See image below. 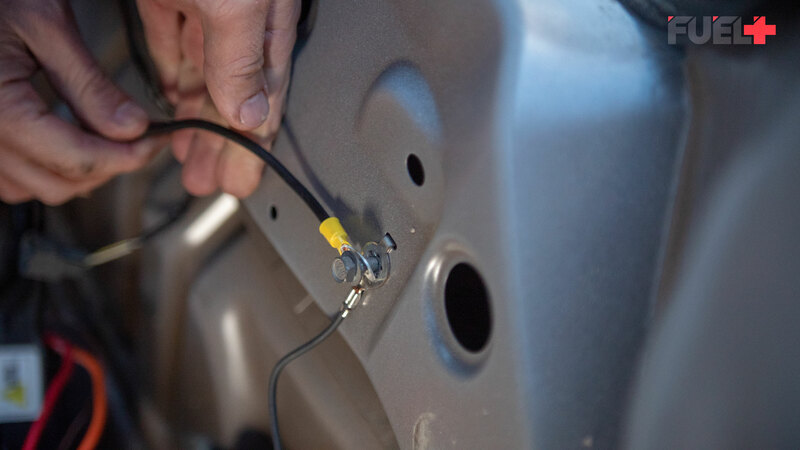 Attach the FUEL+ unit to the chassis, making sure it clears the spare tire. For 2015+ Mustangs, the best place to mount is behind the rear seat armrest trim panel on the driver's side, just above the FPDM. You will need to pull back the panel and remove the foam insert behind it. 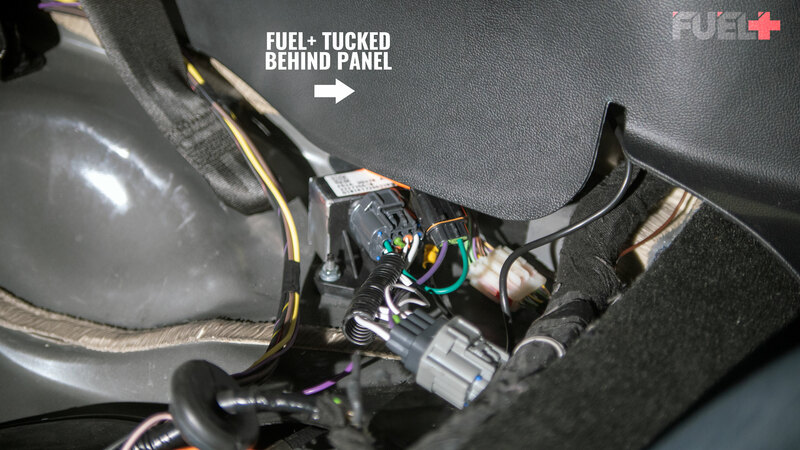 After that is removed, you can affix the FUEL+ unit behind the panel, making sure to tuck any loose wires before replacing the rear seat. See images below. 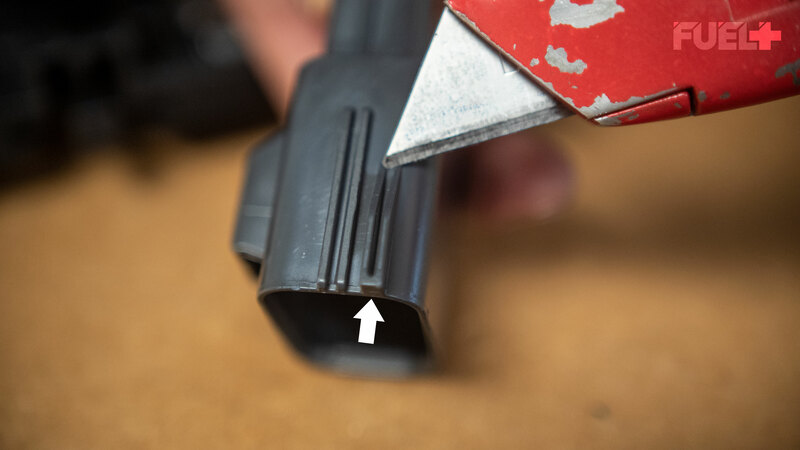 Remove the factory foam insert from behind the trim panel. Attach the unit behind the panel. FUEL+ unit hidden behind the trim panel. 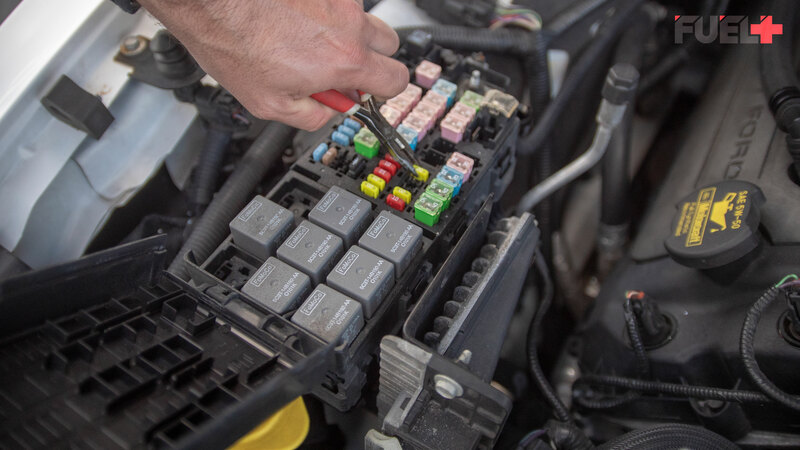 The last step is to replace your factory ATC fuel pump fuse with the supplied 40 amp fuse. See images below. NOTE: This step is not required for the 2015+ Mustang. Replace with the supplied 40 amp fuse. Congratulations! 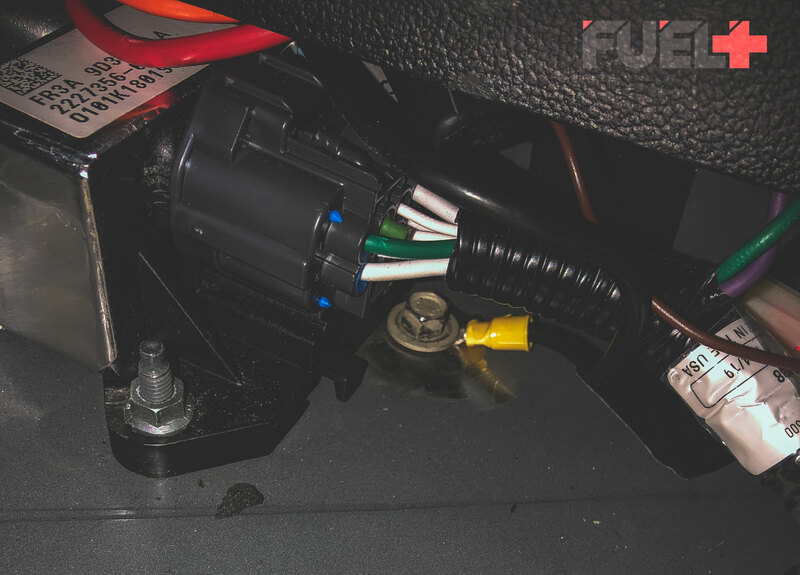 You have now installed the FUEL+ Fuel Pump Voltage Booster into your vehicle. Thank you again for the order & we hope you have fun with your build.